There are six of them but we might finally have an answer as to which Tuilagi brother is the finest rugby player, according to two of the men concerned. Speaking on BT Sport's The Clare Balding Show, Manu and Alesana Tuilagi nominated their brother Andy as the best of the famous set of brothers. "I think Andy is the best," said Alesana, "he plays centre as well, he's got good skills, and then it's Manu. I put myself last because I know I'm the best really…"
England international Manu agreed: "I think it's Andy as well, but I think, with him, that when he plays he just wants to kill people too much sometimes. He ends up injuring himself quite a lot. He's broken both arms and shoulders, but if he didn't get injured he would be the best of us." 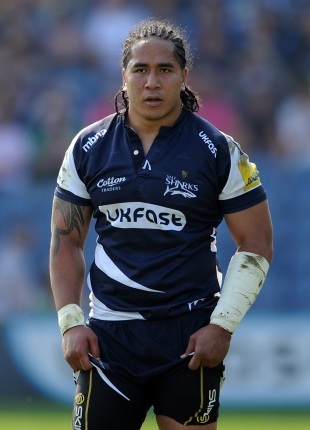 Andy (Anitelea) is a team-mate of Alesana's at Newcastle Falcons, has been capped 17 times by Samoa and is the fourth oldest of the six brothers. The remaining three are Freddie and Henry, who are both former Samoan internationals, and Sanele, a former Samoan U20 international. "With the injury, it's one of those things, I had the same injury three, four weeks ago. It's just unlucky, it felt really good throughout the whole week in training and at the start of the game. I think I got a bit too excited and it went really wrong. I had a scan on Monday and a meeting with the doctor and he said about 6-8 weeks. "It's not good for the clubs and especially for England. It's probably the biggest games so far in the season, especially building up to the World Cup next year. It's very important to get the win over the teams from the Southern Hemisphere. With all the players we have, the competition is high in all areas of the team, we'll be fine." Manu and Alesana Tuilagi were speaking ahead of their appearance on The Clare Balding Show which airs tonight at 10:00pm on BT Sport 2.